We still have a long ways to go until The Home Depot’s Black Friday 2019 sale arrives. 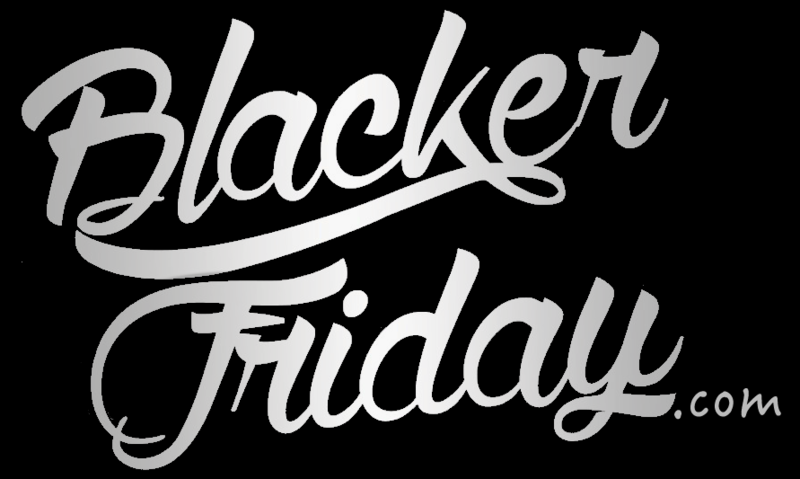 But you can scroll down the page to check out the details from their last Black Friday sale to get an idea of what’s likely to come. Enjoy! Milwaukee M18 Cordless HACKZALL Reciprocating Saw Kit on sale for $159 (normally $249.97 — Save $90.97). Includes battery, charger, and too bag. Model #2719-21. Ryobi 18-Volt ONE+ Lithium-Ion Cordless AirStrike 18-Gauge Brad Nailer with (1) 4.0 Ah Battery and 18-Volt Charger on sale for $159 (normally $269 — Save $110, 41% off!). Model # P1855. Makita 18-Volt LXT Lithium-ion Cordless 7-Piece Combo Kit on sale for $399 (normally $669 — Save $270, 40% off!). Model #XT706. DeWalt 20-Volt MAX XR Lithium-Ion Battery 4-Pack on sale for $159 (Save $119.99 — That’s 43% off!). Includes 2.0Ah (2-Pack) and 4.0Ah (2-Pack) batteries. Model #DCB2032044. DeWalt 15-Amp Corded 12 in. Sliding Compound Miter Saw with Bonus Rolling Stand on sale for $399 (normally $598 — That’s $199 off!). Model #DWS779WDWX726. Ridgid 6 Gal. Portable Electric Pancake Air Compressor on sale for $99 (normally $129). Model #OF60150HB. Husky 28 in. Folding Sawhorse (2-Pack) on sale for $19.88 (normally $39.97 — Save $20.09 per pack). Model #206138. In terms of the appliance deals, they are offering up to 40% off select appliances and up to an extra $500 off on top of that when you buy two or more select major appliances priced at $498 or more. Most units also include free home delivery. One of our favorite special offers is the Samsung 4-piece kitchen suite on sale for $1798. It includes a huge 25.5 cubic foot french-door refrigerator, electric range with oven (gas option available as well), 30-inch microwave, and 24-inch stainless steel dishwasher. There are a number of other great finds as well so it’s worth taking a look at. Offer valid from October 31st to November 29, 2018. What tools, supplies, or equipment are you planning on picking up this Thanksgiving weekend at Home Depot? Let us know in the comments (you’ll find the comments section located at the bottom of this page). Updated on Thursday, November 9, 2017: One of the most anticipated Thanksgiving weekend flyers is here — Home Depot’s Black Friday 2017 ad! And we’ve got it for you posted down below — Enjoy! The sale starts at 6:00AM EST on Thursday, Thanksgiving day online (that’s on Nov. 23) and at 6:00AM on Black Friday (Nov. 24) when stores open. 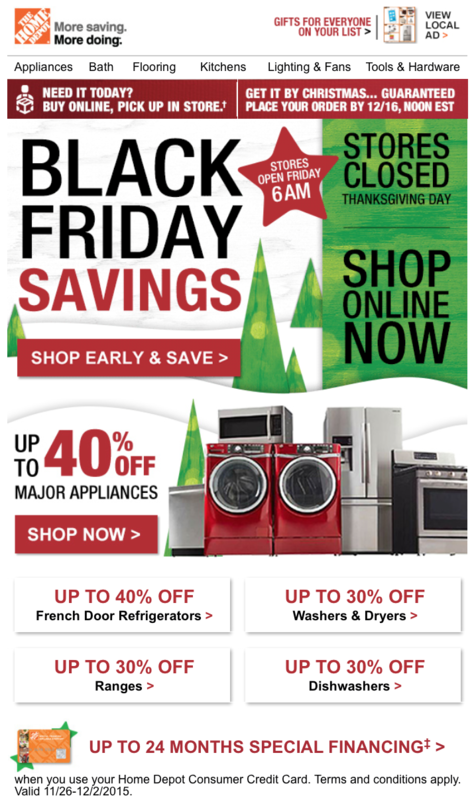 However a select number of Home Depot’s Black Friday deals have already gone live (including appliances) so be sure to check out their site for detials. 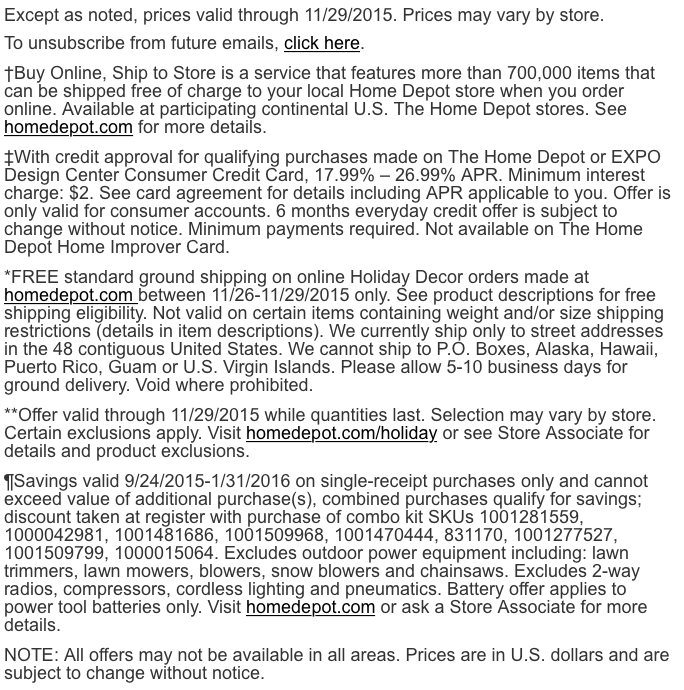 Updated November 14, 2016: Home Depot’s Black Friday flyer was just leaked and we have if for you hot off the presses. Check out the first few pages below and then follow the page links at the bottom of the page to see it all! As is every year, Home Depot will be closed on Thanksgiving Day but will open bright and early at 6:00AM on Friday morning, November 25, 2016. However many of the deal will be available online as well starting at 3:00AM PST on Thanksgiving Day online so that might be your best bet to get what you want this year. Of course Home Depot’s very popular $0.99 cent live poinsettia deal is back again (limit 12 per customer), but you’ll also be able to pick up some pretty good deals on everything ranging from Christmas decor to power tools. It’s also a good time to think about replacing that old kitchen stove, oven or fridge as you’ll find some of the lowest prices of the year through Thanksgiving weekend. It’s early Thanksgiving morning and but now we finally have more details on what we can except to see a Home Depot’s Black Friday sale this year (which are now live at homedepot.com or you can wait until stores open on Friday morning at 6:00AM). This year you can save across the store – from up to $150.00 off select power equipment like Makita and Dewalt to 40% off major appliances like Samsung and Maytag. You’ll also get 24 months of special financing if you decide to pay with a Home Depot credit card. 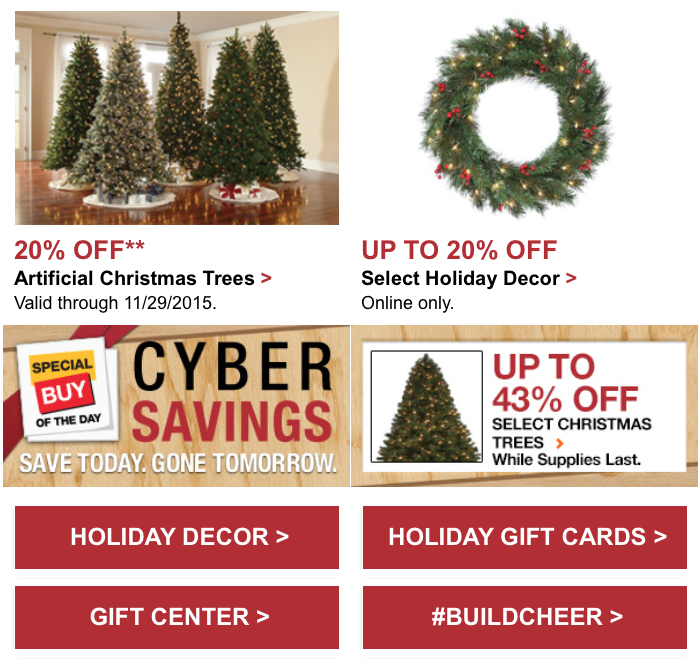 Be sure to also check out all of the deals on christmas tress (up to 43% off) and other select holiday decor at up to 20% off. Just one bit of bad news… anyone looking for a new Honda lawnmower, like me – my dream machine is the Honda GCV190 HRX217HYA Self-Propelled Walk-Behind Gas Mower – is out of luck because they are excluded from these deals. Click on the page links to see this year’s ad scan: Page 1, 2, 3, and 4. If it’s time to replace your existing batteries for all your cordless powertools, then be on the lookout for special buys on rechargeable batteries with two-pack deals priced at just $99.00 – A savings up up to 50% off compared to the regular every-day prices. 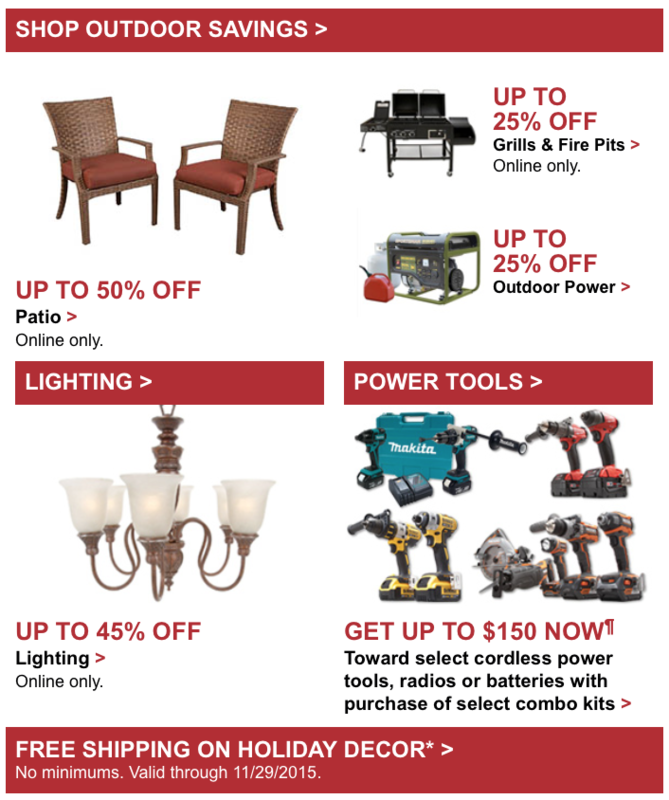 Some of the deals were exclusive just to Home Depot including the 2-pack’s of Milwaukee M18 18-bolt Lithium-Ion XC batteries, Ridgid 18-volt Lithium-Ion batteries, Makita LXT 18-volt Lithium-Ion batteries, and Ryobi One+ Lithium-Ion which capacity batteries. Home Depot’s Black Friday sale will also be a good time to stock up on christmas decorations. For as long as we can remember, Home Depot has been selling 99-cent live poinsettias during the opening of their doors on Friday (starting a 6:00am). They normally go for $4.98 each so if you need to buy a few, then the savings really start adding up. e also expect to see exclusive discounts of christmas decorations, christmas tree lights, wrapping paper, live and artificial trees, wreaths, as well as even some toys. Finally, it’s a good time to start thinking about next summer as we expect to see all the left over stuff from this year on clearance. Last year you could pick up a new Brinkmann propane 3-burner bass grill for just $99.00. They also had a stainless steel gas patio heater and a 34” gas fire pit both at under $100.00/each. Good luck! Search for the nearest The Home Depot store in your neighborhood. If you have order related questions or need product return assistance then you can contact The Home Depot Customer Service by phone at 1-800-466-3337 or email at Customer_Care@homedepot.com. You can also text them at 38698.